If you ever met East Cobb resident Liz Raphael Helgesen, you would probably think her voice sounded vaguely familiar. Her voice probably prompted you to check or leave a voicemail today, or guided you along a MARTA route. You're probably one of the estimated one in four Americans who hears her Lloyd's of London-insured voice everyday. During daily recording sessions held in the 6-by-10 studio in her home's unfinished basement, Helgesen wields her melodic voice to communicate the messages of hundreds of the nation's most respected companies and organizations. The national voice for T-Mobile, Helgesen also does voiceovers for Verizon Wireless, Bellsouth, Cingular, Sprint, IBM, Waffle House, Coca-Cola, Wachovia, Charles Schwab and others. The Centers for Disease Control and Prevention use her voice to relay critical outbreak information worldwide. An attractive redhead, Helgesen has lived in Atlanta since she was 12. Her career in voiceovers began over 18 years ago when she was a human resources manager for a telecommunications firm that needed someone to be the voice for their pioneering efforts in voicemail. In 1996, her voiceover work escaped side-project status when she started Passion Fruit Productions. In the beginning, Helgesen marketed herself aggressively. Although most companies come to her now, if she's inspired by a specific project, she pursues it. One such example is her work with MARTA trains during the 1996 Olympics. "I knew I had to be the voice to tell the world how to get around Atlanta," she says. 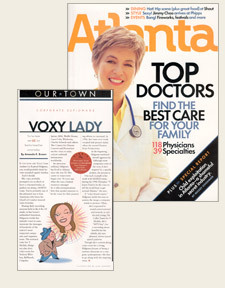 A "voice brand expert," Helgesen molds her tone to convey the image a company wants to project. Often, she's requested to sound conversational and natural, or stylish and young. On Caller tunes for T-Mobile, she's "MTV-hip"; for a recording about benefits for the elderly, she uses pleasant, slower-paced speech patterns. Though she's content doing voiceovers for a living, Helgesen dreams of being a cartoon character or a company spokesperson - the face to go along with the inspiring voice.